Boat Electrics, batteries and charging. Most on board electrics are designed to make your boating safer and more enjoyable. However, there is a plethora of electronic gadgetry on offer to the modern boater. Keeping it all working can seem like having an albatross around your neck. For too many boaters, having a flat battery is a dire emergency. Without power they can’t even use the radio to call out the lifeboat. They are condemned to drift like ancient mariners, alone, alone on a wide, wide sea. Lost without the GPS and unable even to eat without the microwave, which is probably as well, since the pump for the heads is also without power. And when, if ever they do reach the marina again, the skipper with his long, gray beard and glittering eye is first ashore, clutching in his skinny hand, not a wedding guest but the power lead. Before even tying up, shore power is reviving the blinking lights and tweeting gadgetry, causing lights across the town to dim, as power is sucked from the local grid. So how much power is needed? Well the short answer is that it isn’t necessary to have any. My first little cruiser had none. But then she had no radio and no proper navigation lights and no electronic depth sounder to name but a few of the aids which, even I would be loath to set off without now. Navigation was all DR pilotage, GPS being still but a twinkle in someone’s eye. Night sailing entailed keeping a constant watch and taking huge detours around anything which did have lights showing, and clutching a torch in the hopes that shining it on the sail might make me visible in an emergency. However, those were primitive times. Nowadays it seems, even to me rather silly not to take advantage of the miraculous advances which have been made in the use, generation and storage of electricity on board small boats. Unfortunately there is a huge caveat. Electricity and water do not mix, nor do electronic devices like damp environments. So while it may be silly not to take advantage of these inventions, it is even sillier to be totally dependent on them. I am pleased to boast that I have rewired a previous boat and that I installed the complete wiring system on Mignonne which, does actually work. However, I must admit to having less understanding of the logic of the average circuit diagram than of an Australian Aborigines dot painting. And some of my wiring is more Rastafarian hair style than neat loom. For those who are in that select group who repair the Christmas tree lights by juggling a hand full of duff bulbs, kicking the cat when they still don’t work, then going out to buy a new set. Never fear if I can get my boat electrics to work, so can you. 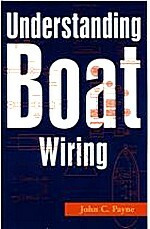 However, for the best practical and technical help and see John C Payne, marine electrician and best selling author of “Marine Electrical and Electronics Bible” as well as many other boating books on sailboats and yacht systems. The basic set up on a boat is akin to that on your car. You need a battery to start the engine and while the engine is running it will be turning an alternator which produces enough electricity to both re-charge the battery and run the lights, the radio and such like. However, anyone who has switched their car engine off but left the lights on, will know that the cranking battery will soon go flat. This is the normal car type starting battery. It is designed to give occasional short bursts of a large amount of current specifically to turn the engine starter motor. But it doesn’t like being used for long periods nor will it take kindly to being run flat. These are designed for use on electric trucks, golf carts and the like, which are deeply discharged every day. They are long lasting as they can tolerate numerous deep discharges and recharge cycles. However, they are large, heavy and expensive. These are the usual ‘Domestic’ or deep cycle batteries found on small boats. They are designed to provide small DC (direct current) voltages but over a longer period. They have slightly thicker lead plates than ordinary cranking batteries so they can withstand deeper discharges and are much more tolerant of being run flat. However, they are of the unsealed lead acid type, so must be maintained by topping up the cells with deionized water. This also means that they will spill acid if tipped over, and can produce oxygen and hydrogen gas if they are overcharged, this gas must be vented to avoid explosion. These leisure batteries give you the most power for your money, but they have a shorter life expectancy than more expensive batteries. With these the acid is gel-like therefore unlikely to leak if the battery is tipped over. An ideal ‘domestic’ battery that can withstand many charge cycles. They are maintenance-free and have a low self-discharge rate. These (AGM) batteries avoid leakage by containing the acid within glassfibre mats in between the plates. They can accept high charging voltages and many charging cycles. They are particularly suitable for high current applications. These also use glass-fibre mats to contain the acid but the lead plates are larger, thinner and wound in a spiral. They can accept higher charge rates and tolerate much more shaking and vibration. The latest developments in high capacity lithium-ion technology are beginning to provide a viable alternative to traditional lead acid batteries. And they are about a third of the weight of an equivalent lead-acid battery. Lithium Ion batteries have a level power curve, which means that you have full power until the battery is dead, so little warning time before you have no power. But they can take many deep discharges and can be charged up to 90-94% of their capacity in a third the time of a lead acid battery. However, charging needs to be closely controlled. Whether or not weight is an issue on your boat they might be worth the investment in the future if the price begins to drop. Recharging batteries can for some yachtsmen become something of a religious obsession. Fortunately for those of an obsessive disposition there are various bit of circuitry designed to make charging and battery use more efficient. The increasingly popular deep cycle leisure batteries do have different Battery Charging requirements. Isolator switches (blocking diodes) will balance the drain and charging across the batteries. So called 'smart chargers' can control the alternator’s output in order to speed up charging. And there are enough monitors and display units available to satisfy the most ardent devotee. Great advances in the efficiency of alternative charging methods have been made in recent years. The most common being wind generators and solar panels. Most boat systems are 12 volt. Those who cannot bear to forgo their television sets and the like, for too long, will need an inverter. This will convert the 12 volt DC to the AC voltage needed to run most domestic appliances. Small inverters are fine for running a TV set or computer. Larger ones can even supply enough power to run a washing machine. However an inverter can only convert and deliver what your batteries have to give. As a very rough guide, an inverter's maximum output, in watts, will be at best, somewhere around 5 times the total amp-hours of your battery bank. And, using such lot of electricity can very quickly discharge your batteries, unless you’re consistently running the engine. For many boaters, plugging into a marina’s power supply has become part of the ritual of tying up. It is perhaps worth remembering that the trip switches and fuses on the marina’s power points are there, primarily to protect their equipment from anything stupid you might do. It is up to you to ensure that your system is safe. That means making sure that cables are water proof and kept as far from water as possible. You should have a separate, fused distribution system to run the wiring through the boat to you appliances. Faulty electrics and poorly installed electrical systems are a source of potential hazard to you and your crew. Short circuits and overheating cables are both common causes of boat fires. While complicated wiring systems are best left for the qualified electrician part of everyone’s routine maintenance should involve checking for any worn or damaged cables or wires and having them repaired or replaced. Check that cables particularly battery cables are secure. Make sure that your fuses and circuit-breakers are correctly rated for the circuits they protect. And reduce any potential risks from flammable hydrogen gas, produced when charging your batteries, by stowing them in a secure and ventilated area. But above all learn how to cope without any electrical power or associated gadgetry. Don’t allow electrics to become an albatross weighing you down, spoiling your enjoyment or putting you in danger. My Boat 1965 Owens Tahitian Hi all, is there anyone out there that can help us with our small wiring situation?? ?